The holiday weekend wasn't particularly festive for the UFC, as Christmas Eve brought a blow to next Friday's UFC 207 card. After days of rumors, ESPN's Brett Okamoto reported that Cain Velasquez is out of his previously scheduled fight against Fabricio Werdum after being pulled by the Nevada State Athletic Commission for medical reasons. Velasquez took to Twitter after the news broke to express confusion about being pulled from the card. He said that he hadn't heard that he was off the show and that he had been cleared by his doctor, but Okamoto then tweeted that NSAC executive director Bob Bennett had confirmed on the record that Velasquez's license had been suspended because of the medical issue. "Based on medical records, interviews and the best judgment of Chairman Anthony Marnell, Attorney General J. Brin Gibson, the executive director's office and our physicians, in an effort to protect the heal and safety of the athletes, it's been determined Cain Velasquez is unfit to fight," said the commission. "The financial incentive for fighters to compete is strongly compelling, and it is the responsibility and obligation of this commission to intervene when excessive risks are evident. It's obvious Mr. Velasquez is physically compromised and competing would place him in significant physical risk." The status of the fight was put into question earlier this week with speculation that Velasquez had pulled out of the bout. Dave Meltzer noted in Thursday's daily update that those rumors weren't true, but that the former heavyweight champion had a back injury that would require surgery after the fight. The surgery was scheduled for January 4th. Velasquez addressed the rumors and his injury status yesterday in an interview with Ariel Helwani of MMA Fighting, where he said that the UFC asked him to get further clearance after he had revealed the injury. Ronda Rousey's return to the Octagon for the first time in over a year after her loss to Holly Holm at UFC 193 headlines next Friday's card in Las Vegas, Nevada. Rousey will challenge Amanda Nunes for the women's bantamweight championship. Dominick Cruz will put his bantamweight title on the line against Cody Garbrandt in the semi-main event. Velasquez vs. Werdum was scheduled to be the third fight from the top with the winner becoming the most likely challenger for heavyweight champion Stipe Miocic. 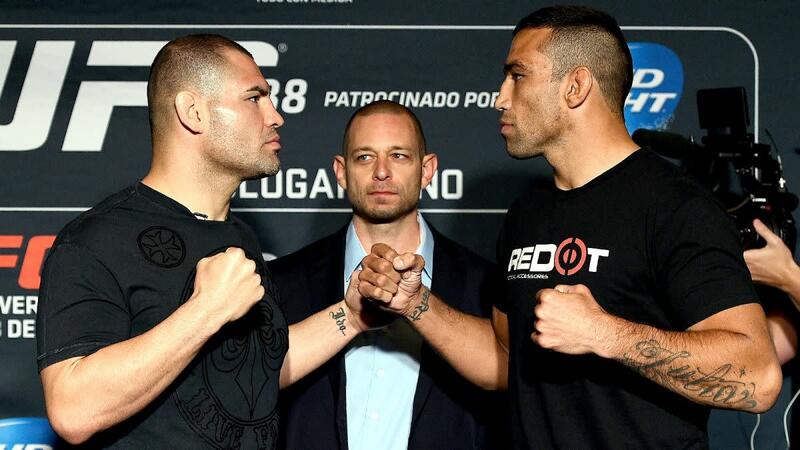 It would've been the second fight between the two after Velasquez lost to Werdum at UFC 188 in his first fight back after a lengthy absence due to a knee injury. UPDATE: In a statement, the UFC said that UFC 207 will proceed with 10 fights now that Velasquez vs. Werdum is off the card. That means that Werdum won't get a replacement opponent.